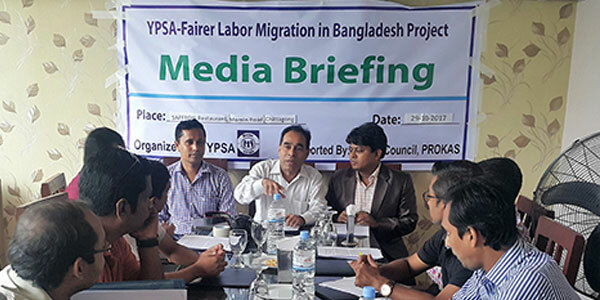 YPSA organized a media briefing on the outcome of baseline survey of Fairer Labor Migration on 29 October 29, 2017 at Saffon Restaurant in Chittagong. Different Print and Electronic media representatives were present in the program. The challenges, gaps and barrier of fair migration were shared in the briefing. In addition to 11 suggestions were proposed for improving the transparency and accountability of the migration process. Md. Mahabubur Rahman, Director, YPSA was present as a moderator while Program Manager of YPSA-Labor Migration facilitated this meeting. After the briefing journalist asked different questions on research. Project personals have given answer of that questions as well as shared the achievement and progress of labor migration project. Finally invited journalist also proposed numerous suggestions. In research, the types of respondents are aspirant migrant, returnee migrant, migrant family, recruiting agency, middleman, District Employment and Manpower Officer (DEMO), Union Parishad and community leaders. The research methods were questionnaire survey, focus group discussion, key informant interview and literature review. 270 questionnaires were designed to conduct the survey. The research has find out the following barriers and gaps in regards of labor migration as well as grievance mechanism. According to baseline survey it was found that 70% of the respondents have done their migration process through middleman. Most of the respondents said that they had to pay additional fifty percent cost on collecting passport. The main reason is that they operated this phase through middleman. Most of the respondents said that It was twice the time they had to wait in getting their passport. Though it is mandatory to enroll in recruiting agency in regards of overseas operation. But it is true that about 70% of respondents does not know the services of Recruiting Agency as well its information. About 80% of the respondents said that they did not know the name of District Manpower and Employment Office. According to the baseline survey it was found that about 70% of the respondents agreed that the lack of skills is the major drawback of migrants. About 90% of respondents agreed that they collected visa from their relatives, neighbor and middleman. In regards of dissatisfaction, most of the respondents were dissatisfied of services of passport department, DEMO services and TTC. In addition to respondents argued the services of medical fitness centers. Alike the miss cooperation of embassy in destination countries and accessibility. Though the only dispute resolution center of overseas disputes in BMET, Dhaka. Due to locational factors it is very hard to access marginalized migrants in seeking remedy of overseas disputes. About 91% of respondent said that it would better if authority setup a local grievance mechanism on settling the overseas related disputes.